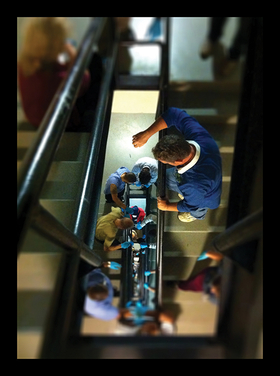 The "bucket brigade" at work in a Bellevue Hospital stairwell after Sandy hit. Staff members delivered fuel to the generators through the night and into the next day, when National Guardsmen took over. Days after Superstorm Sandy struck New York City on Oct. 29, 2012, a line of people snaked up the stairwell at NYC Health & Hospitals/Bellevue Hospital, passing bucket after bucket of fuel to each other up and up to the 13th floor, where the generators stood. The hospital had been on backup power since the night of the storm, and the fuel pump and elevators weren't working. "It was a full moon and a high tide," said Marcy Pressman, Bellevue's deputy executive director, and evacuation was not an option because the facility was designated a "shelter in place" hospital. Unlike hospitals in Texas, which were mostly prepared for Hurricane Harvey's recent deluge and relied on flood barriers and other protections to stay open for business, some of New York's were hit particularly hard five years ago. At Bellevue, two days after Sandy struck the hospital had no other choice but to evacuate its 736 patients. Other hospitals in the area also evacuated their patients to dry facilities. Bellevue, which had been open continuously since 1736, closed for the first time. NYU Langone Medical Center closed its emergency department, too, as did other facilities—some for months—as they struggled to recover after flooding. It took some of these hospitals a long time to get back on their feet. In many areas, they found that the key is a combination of staying dry and being redundant: Have more than one generator and have those generators and fuel up high, and have patient data in more than one place. With that in mind, these hospitals fortified themselves for the global-warming strengthened inevitable next storms—including Hurricane Irma, on the tail of Harvey—as they put what they learned into practice. By the time Sandy hit New York City, it was actually a post-tropical cyclone. But that semantic downgrading didn't mitigate its destructive powers. At NYU Langone, along the East River, the water came in quickly. The medical center lost power, and it couldn't send its elevators into the flooded shafts, leaving staff to carry patients down stairs and out of the buildings. The 15 million gallons of water that eventually flooded in ruined medical equipment, such as MRI scanners and linear accelerators. "Once the water entered the facility at the lower levels, it spread throughout and eventually made its way through all the lower levels," said Vicki Match Suna, senior vice president and vice dean for real estate development and facilities at NYU Langone. New York City hospitals say they're stronger and more prepared than they were five years ago when Sandy pounded the Northeast. At Bellevue, mere blocks away on Manhattan's east side—and also in the city's highest-risk hurricane evacuation zone—elevators were also inoperable. Within a half-hour of when water began filling the basement, power failed, and the hospital's emergency power automatically activated, keeping ventilators and other critical machines up and running. But then the hospital's fuel pumps failed. "I asked how much fuel we had," Pressman said. "We calculated on a napkin that we had an hour's worth of fuel in the generator. After that, the entire hospital would go dark"—including other generators being run by the emergency power system that activated earlier in the night. 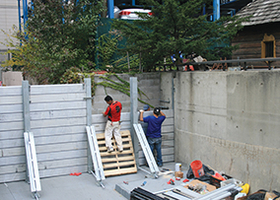 Workers at NYC Health & Hospitals/Bellevue install flood barriers at the 26th Street ramp to the basement loading docks. "We were all just kind of looking around at each other, and one of our engineers said, 'All we have are these buckets in the basement.' " Pressman assembled what she calls the "bucket brigade" in one of the hospital's south stairwells, which ran all through the night and into the next day, when National Guardsmen took the hospital staff's place on the stairs until Saturday, when enough water was pumped out for two elevators to be restored so the last two patients could be evacuated. "Their only introduction to New York was coming to Bellevue and passing the fuel up to the 13th floor," Pressman said. While the bucket brigade worked to keep the hospital powered up, others evacuated patients, some of whom were slid down stairs on sleds. While the hospitals on the receiving end of evacuated patients were expecting them, Bellevue staff still attached notes to the patients with a phone number in case there were questions. "We made sure the patients landed well and that the families had information," Pressman said. There's no good time for a major storm to a hit a hospital. But for NYU Langone, which ultimately spent $1.5 billion in Federal Emergency Management Agency and hospital funds on repairs and fortification after the storm, the timing worked out, in a way, since Sandy struck while the organization was in the midst of a major building project. One part of the project was a new energy building. After the storm, engineers increased the planned power-generation capacity of the building and raised the height of flood barriers around it and other buildings. NYU Langone's emergency department also was under construction when Sandy hit. After the hospital closed the emergency room because of the storm, it decided to keep the facility closed so all of the renovations could be completed at once, which actually sped things up. "It was the rare opportunity to fix a lot of things that are hard to fix in hospitals because they're always occupied," said Paul Schwabacher, NYU Langone's senior vice president of real estate development and facilities. For instance, the hospital was able to clean all of its ductwork and abate all of the asbestos in the old buildings at the lower levels. Meanwhile, the medical center worked to reopen other facilities, and by Dec. 27, NYU Langone's Tisch Hospital was ready for inpatients. Bellevue crept back into action around the same time. By Christmas of 2012, Bellevue had a free-standing emergency department open, and on Feb. 7, the full hospital reopened. But fortifications were far from complete. In the first six months of recovery, Bellevue and two other public health system facilities spent more than $125 million on emergency repairs. Then, over the next several years, the hospital took care to reinforce the systems hardest hit by Sandy. Unlike after 2011's Hurricane Irene—which wasn't as bad as predicted and created what Roslyn Weinstein, NYC Health & Hospitals' vice president of operations, called a "false sense of security"—Bellevue got more serious about building resiliency into its operations after Sandy. The hospital installed sensors on the tops and bottoms of elevators to detect water. It put quick-connects on its generators so hooking up cables would be easy regardless of brand. And, like NYU Langone, it installed large flood barriers and raised critical infrastructure such as electrical, mechanical and IT systems, to much higher levels. Both hospitals relied in part on aid from FEMA, which gave NYU Langone $1.13 billion in July 2014. Bellevue shared a $1.6 billion grant, announced in November 2014, with three other city hospitals. Though improvements to physical structures made up the bulk of hospitals' response to Sandy, there were also adjustments to emergency response plans. "The longer-term climate change challenge is really difficult to address," Schwabacher said. "It has enabled us to take a longer view and incorporate more current research in terms of what the potential climate change will be. In the future, Sandy will be a pretty minor storm," he said. "One aspect of planning that we worked on a lot was our ability to rapidly protect the campus." If and when another storm hits, the hospital will need to decide when to raise the barrier around its energy building—a decision the city can help it make by providing real-time updates on emergencies. Bellevue, for its part, codified what it learned from the storm. The hospital continues to rely on its command center for managing communications during emergencies. "We now have a close and cohesive emergency management methodology and process," Weinstein said. If there's an emergency, the command center is in constant dialogue with New York City's emergency management staff, rather than leaving each hospital to fend for itself. "There is one place of truth," Weinstein said, emphasizing the importance of working as a system during emergencies. "The more robust your communication and redundancies, the better." Teamwork was, in part, what got the hospital through the storm, but it was also one of the things that needed to be rekindled, as it suffered in the aftermath when providers were scattered across NYC Health & Hospitals' entire system. "It took us a good six months after reopening to get our groove back," Pressman said of Bellevue. "It wasn't just the building that was broken, it was the teams too."